As the protests in Ferguson continue to demand justice for Michael Brown, one artist’s response to the murder has resonated across social media. As the protests in Ferguson continue to demand justice for Michael Brown, one artist’s response to the murder has resonated across social media. Journalist and artist Shirin Barghi created a series of images that a feature simple objects, such as a bird, a pair of glasses or a flower, along with the last words of unarmed black men who have been killed by police over the last few years. 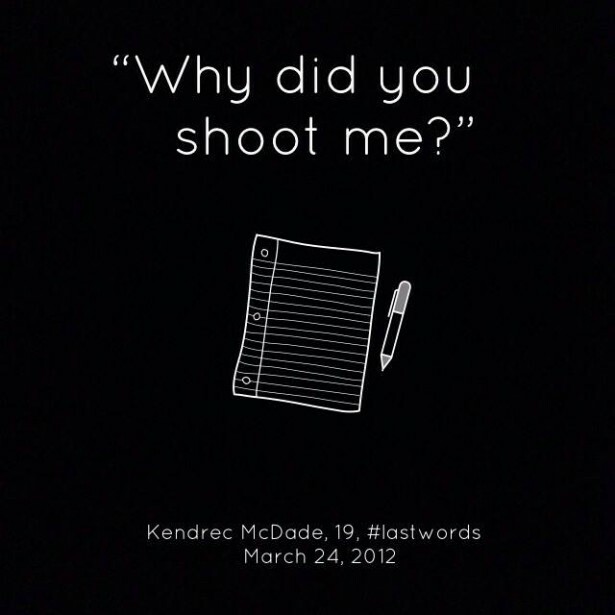 She has shared these images over the last week on her Twitter, Facebook, and Imgur pages with the hashtag #LastWords. Among the 11 men memorialized in these images are Sean Bell, Amadou Diallou, Oscar Grant, and the most recent victims, Eric Garner and Michael Brown. Shirin explained that she drew inspiration from her own experience with police abuse in her home country. “I experienced police brutality in my native Iran and the struggle to confront that violence here resonated with me,” she said. While simple, these graphics serve to humanize black victims of police murder and to peel away justifications or excuses that the media has focused on with Michael Brown. They serve as a reminder that each of these victims were people, that they were frightened and that their deaths are all unjustified. Because #LastWords keeps the humanity of these victims intact, viewers can begin to understand the history of police violence against young black men through these graphics and how systemic inequality remains ingrained in the United States. Shirin stated that she created these graphics not only to remember victims of police brutality but also to show how such abuse is becoming widespread and perhaps normalized. “I created these images to raise awareness about racist police violence in America,” she said.